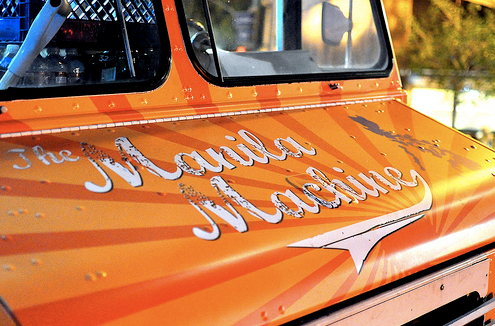 I have been absent from the blog lately, but for good reason … I am now co-owner of LA’s first and only Filipino gourmet food truck, the Manila Machine! It has been so exciting and crazy the past few weeks. The Manila Machine officially launched last Thursday June 10th at the Downtown LA Artwalk. The response was overwhelming. We got a great spot right on the corner of 5 th and Main and before we finished parking we had a line of people. Three and a half hours later we sold out of everything on the truck. What a night! Tomorrow we will be at the Americana at Brand for Street Feast, which is sure to be a huge event. I’ve been rolling lumpia, baking leche flan and buying up the city’s ube! So come share in the fun and try some tasty Filipino home cooking off a truck! 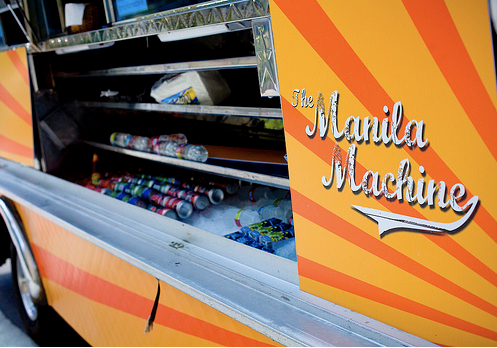 Follow us on twitter @manilamachine to find where the truck is rolling each day. Hope to see some familiar faces out there! Glad we were there during the launching although you were already sold out when we came… congratulations to you and Marvin! See you around LA! Can't wait to try and devour your food! Congrats again on this huge venture! Yay! Congratulations! What a great & exciting (&, I'm sure, delicious) new adventure. Congrats! Looking forward to getting back to LA and trying everything! Wow! Congratulations! I only wish I lived nearby so that I could eat some! Congratulations! So looking forward to trying your food. I'll track you down sometime this week and come and say 'hi'! Can't wait! It was great seeing you last night! The fried banana dessert I got was amazing, I'll definitely be tracking you down again soon! !